Handy tip: you’ll need your mobile number, password, address and date of birth ready for the call. Good to know: this process takes up to 2 working days. Once you have your PAC code, log on to your account and go to your dashboard. Scroll down the page to the 'Transfer your number' section and follow the on screen instructions. 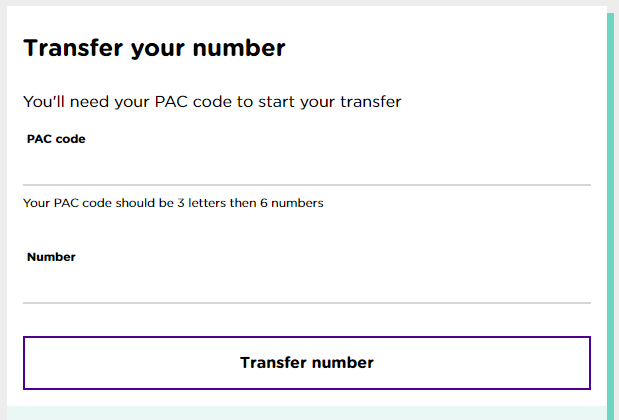 Enter the PAC code and the number you wish to transfer to Superdrug Mobile. Any add-ons you purchase during the port (for example, data and cash add-ons) won't appear on your dashboard until the port is complete. We'll send you an email and a text to let you know when it's done. Yay! What happens on the day my number moves over? Pop your SIM card into your mobile. The transfer usually happens between 11am and 5pm; sometimes it might take until the end of the day. You’ll experience a short loss of service while the transfer is happening – this is totally normal. You might need to restart your mobile for everything to start working, so give this a try if anything ‘odd’ seems to be going on! If your number hasn’t switched over by midnight on the day your transfer was supposed to take place, please get in touch with us via web chat. iPhone users: If your iMessage isn't working after porting, it's usually because you need to amend your settings. When you activate your SIM, your original iMessage number is replaced with the new Superdrug Mobile number. Even when the porting process is complete, your iMessage number will not change back to your old number. Step 2: Go to Phone and then My number. Step 3: Manually change the number in this field.